A feature wall is the perfect setting for a wall mural. A mural will draw the eye to the feature wall, setting the tone for a room's decor scheme. Additional decor elements can easily be played off of a large mural with much visual interest: coordinating colors, shapes and patterns can be derived from an compositionally balanced wall mural. Behind the bed we often find a headboard of some kind. Switch things up and use a custom wallpaper installation as opposed to a standard headboard. Use your own image to make a customized wallpaper that is truly one of a kind produced by Great Wall Custom Coverings. 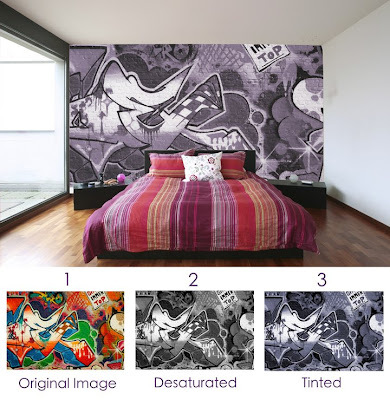 The above images illustrate such a process: an original digital image is captured of a random patch of graffiti. However, though the image is strong compositionally, the color scheme is wrong for the room; a more subdued, even toned look will make the bedroom feel more calm and relaxing. This is where our designers step in to make the custom wallpaper buying experience truly custom. Using the present color palette from the walls and fabrics, we desaturated the image to black and white, and added a color filter to tint the image with a complimenting purple hue that blends seamlessly with the wall color and duvet. Start your custom wallpaper project now, visit Great Wall's custom order page to begin the process!